With the recent release of Super Mario Galaxy 2, which has gotten universally praised ratings like perfect 10s and 9 out of 10s. I decided to review one of the other recent Mario games for the Wii. Now I know this game has already come out, but due to other games taking up my time, I haven’t been able to fully enjoy this game. Of course this game I’m talking about is the well received and multiple time winner of Best Wii Game of 2009, New Super Mario Brothers Wii. A lot of people including me were very excited to finally see a 2.5D Mario game that was coming out for a console since it brings back Mario to his old roots as a 2D platforming genius. I might be bias, but a lot of games of today kind of owe it to Mario for bringing in the genre. Sonic wouldn’t be around, Splosion Man wouldn’t be around, and even Wario wouldn’t be around. So lets go down the green pipe and find out why this game is so awesome. I easily could have used one of the horrible jokes from the Mario cartoon show of the 80’s, but I think that would have killed the review. The main story of this Mario game is to no surprise of any Mario fan. Princess Peach is celebrating her birthday, as she is about to enjoy her cake, Bowser Jr. then appears and is not alone. He is joined by Bowser’s other kids…wait WHAT?! The children of Bowser who haven’t appeared in a video game since Super Mario Brothers 3 on the NES are finally back?! Holy cow that is awesome! I mean you could count that they were in a pile of crap third party made CDI game, Hotel Mario, but who cares! They are in an actual Mario game and it’s been like a zillion years! Now that I got that out of my system. I know Mario games don’t have a strong story, but its Mario. Don’t get me wrong, I love games like Heavy Rain or Batman: Arkham Asylum or any game with a strong story, but there is a certain charm with Mario games since they don’t have long winded stories and stupid easy to see plot twists. Then again why would you need an epic tale of a princess getting kidnapped by some evil beast? I mean its not like Nintendo doesn’t have an epic adventure game where you are sent to save the princess. Oh wait that’s Nintendo’s other big franchise Zelda. The game play is classic 8-bit and 16-bit Mario, a 2.5D platformer. The whole game takes place on a map like Super Mario Brothers 3 and Super Mario World. There are about 8 maps including a secret 9th world if you get all the star coins. You basically can go through this game alone and get through the game fine. You can do something better and go through the game with a second player, but not like the old games on the NES and SNES. This time you can play with up to 4 people at the same time! This has never been done before and I thought it was a good idea. You will hear more of what I think later in the review. Of course with every Mario game, there are power ups. You get the basic mushroom and fire flower. This time though you get a lot of cool ones like the propeller mushroom that gives you a propeller suit and can give you an extra boost of flight. You can also dive bomb enemies. You also get the tiny mushroom that turns Mario tiny and can get through special areas and can run on water and jump pretty high in the air. This happens to be my new favorite mushroom since me and my cousin played through a level with it and it was fun as it can be being tiny. There is also an ice flower form the Galaxy games, but its more like the fire flower suit wise where you can throw ice balls to freeze enemies and use them as projectiles or plat forms. The final new power up is the penguin suit where you can also throw ice balls, but you can swim easier and slide on your belly on ice. It’s really fun when you get it down. There are other things like invincibility stars, POW blocks, and a propeller block that can be a substitute propeller mushroom. The main motion controls is basically limited to where you can shake the remote to make you spin in the air, guide a flash light, and move platforms. You basically do stuff like collect coins and special star coins that unlock special videos of certain levels. The graphics and the look of the game is very outstanding. The 2D look of the game has been locked in a safe for a decade or so and it hasn’t looked better. The music is also very enjoyable with remix of favorite tunes of the Mario library. The difficulty of the game is just right. It isn’t too easy, but it is somewhat hard. Though it kind of cancels itself out because it’s mimicking the difficulty form the old Mario side-scroller games. A special thing that was implemented into the game is a guide called the Super Guide. It unlocks if you die about 8 times on one level. If you activate it, the computer plays through the game as Luigi. Yeah you lose a little of your pride, but it helps when you need to get through the game. don’t like. First off are the playable characters. Why Toad? Why not Donkey Kong or Wario? No one wants to play as a freaking Toad. They should have added unlockable characters or somehow got Wario and Donkey Kong through the story or something. My next complaint comes from the difficulty of some levels. Sometimes it’s just tedious to get through a level from time to time, but like I said earlier, it kind of cancels itself out. my final complaint comes from playing with 4 people. it gets a little chaotic. I can understand where Nintendo was coming from with this idea, but it gets annoying since someone can be a total jerk and get the rest killed. 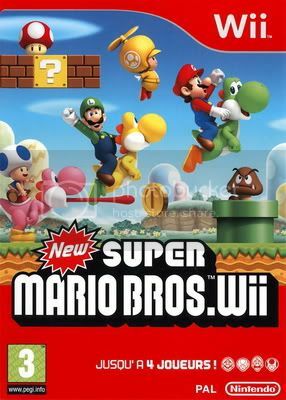 All and all, New Super Mario Brothers Wii is one of the best if not the 3rd best wii game of all time. I say go buy it! It’s a fun game to play with two people and three people. I think they should make a sequel to this game. Please Nintendo do this and I will be a happy reviewer/gamer. Thanks for reading and make sure to send me an email of a game you want me to review or recommend at moonstone140@gmail.com. See you all next time!